UNITED NATIONS: UN Secretary-General Antonio Guterres on Tuesday appealed to Myanmar’s authorities to put an end to the violence in Rakhine state and take steps to provide Muslim Rohingyas there with “a normal life”, reports AFP. Nearly 125,000 mostly Rohingya refugees have crossed the border to Bangladesh in recent weeks, fleeing a security sweep by Myanmar forces who have been torching villages in response to attacks by Rohingya militants. “The grievances and unresolved plight of the Rohingya have festered for far too long and are becoming an undeniable factor in regional destabilization,” Guterres told reporters. The UN chief last week had called for restraint by the security forces to avoid a humanitarian catastrophe from the refugee exodus, but on Tuesday he stepped up the pressure, appealing to authorities to end the violence. 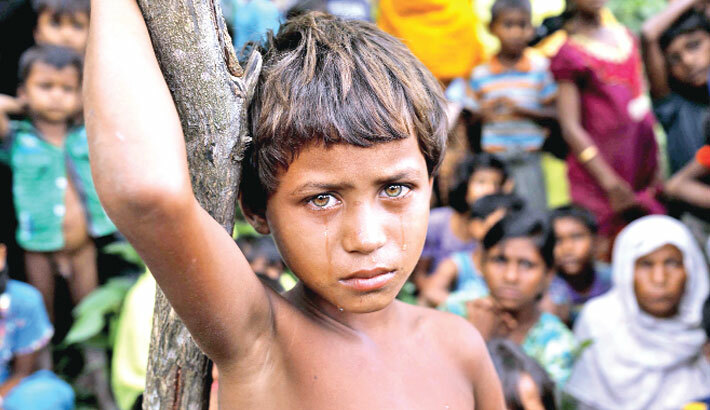 Myanmar’s government must grant the Rohingya “either nationality or at least, for now, a legal status that will alow them to have a normal life including freedom of movement, access to labor markets, education and health services,” he said. The Muslim Rohingya are seen as illegal immigrants in mainly Buddhist Myanmar and have suffered decades of persecution, according to rights groups. The United Nations has repeatedly called on Myanmar to grant the Rohingya rights, and a recent UN report said the brutal crackdown against the Muslim minority could amount to crimes against humanity. The UN children’s agency UNICEF said 80 percent of the Rohingya refugees who had fled to Bangladesh were women and children. In northern Rakhine state, UNICEF workers are unable to reach 28,000 children in need of care while work on clean water, sanitation and school repairs has been suspended, the aid agency said in a statement. Guterres wrote to the UN Security Council, calling for a strong message to be sent to Myanmar on the need to end the violence in Rakhine. The council met last week to discuss the crisis, but there was no formal statement following the closed-door meeting. Myanmar’s de facto leader, Nobel laureate and democracy icon Aung San Suu Kyi, has come under fire over her unwillingness to speak out against the treatment of the Rohingya or chastise the military. Guterres declined to criticize Suu Kyi when asked about her failure to speak out, saying that the situation was complex. “We want a Myanmar that is democratic but we also want a Myanmar where the Rohingya will see their rights fully respect,” he said.